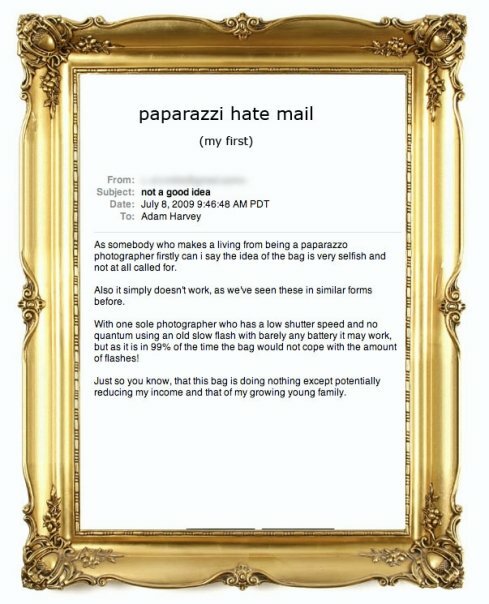 My ITP classmate Adam Harvey has invented an anti-paparazzi clutch bag that “communicates the desire to NOT be photographed.” According to Adam, “when the device detects a camera flash it responds with another flash that obscures the photo.” Awesome idea Adam! “Reducing income for my growing young family”!? Oh no, the paparazzi are breeding? If he’s worried that the device won’t work, why is this pissed-off paparazzo worried about his economic livelihood? By the way, for the record, I’ve tried out the prototype, and it definitely works. In any case, I think that celebs should take a cue from the late King of Pop, Michael Jackson (peace be upon him), and wear a burqa in public to avoid being photographed. I don’t want to name anyone in particular, but if your last name is Hilton or Beckham, you might want to consider it. But if you are a celeb that MUST be seen in public sans-burqa (like if you’re in France for the Cannes Film Festival, for example), then check out Adam’s site for more information about his invention. A limited supply will be available in Spring 2010.